The Phoenix Coyotes ownership is in disarray. The management and coaching is a mess. The team has the lowest salary totals in the league. With all that being said, the Coyotes must be one of the worst teams in the league, right? Wrong! Phoenix currently sits at the 4th in the Western Conference, just five points behind the league-leading Chicago Blackhawks. So how are they doing so well while spending so little money? Time to go to the numbers. The Coyotes have just two players with more than ten goals. No player has 25 or more points. However, what Phoenix lacks in star power, it makes up for in consistency. Twelve players have double-digit points with nine of them having 17 or more points. Fourteen players average more than fifteen minutes on ice per game. 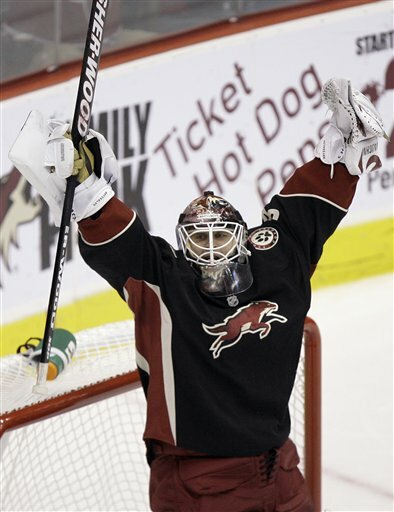 Most importantly though is the Coyotes goalie, Ilya Bryzgalov. Bryzgalov ranks fourth in the NHL in GAA and is tied for third in save percentage. He leads the league in shutouts, is second behind Martin Broedur in wins, and is tied for second in games played. Bryzgalov has carried the Coyotes all year. Bryzgalov is making $4.26 million per year. That’s good for 16th in the league among goaltenders. How’s that for a steal. Shane Doan’s 24 points are the most on the team and his salary, $4.55 million, leads all forwards. Radim Vrbata has the second highest salary ($3 million) amongst forwards and his third on the team with 22 points. Matthew Lombardi has the third highest salary ($1.817 million) and the second most points (23). Those are all reasonable salaries. Besides Bryzgalov, Phoenix gets the most bank for the buck with players 4-10. Scottie Upshall makes $1.5 million and has 21 points. Robert Lang makes $1 million and has 20 points. Keith Yandle has 19 points and makes $1.2 million (and is a defenseman). Another defenseman, Adrian Aucoin makes $2.25 million and has 18 points to go along with his 23+ minutes of ice time a game. Ed Jovanski is possibly the only overpaid player on Phoenix at $6.5 million. The defenseman has 18 points and averages 21:30 TOI a game, but that salary is still too large. Martin Hanzal makes just $980k and has put up 17 points. These salaries are normal on most clubs for fill-in players and third or fourth line forwards. For Phoenix, these are the team’s top players. For the team leader in points to make less than $5 million is pretty remarkable. Doan’s salary is the 52nd most expensive amongst forwards in hockey yet he is the most expensive forward for the Coyotes. So hats off to Coyotes’ GM Don Maloney. He dipped into the bargain bucket and pulled out some gems. Time will tell how good these gems are, but for now, they are shocking the hockey world. ‹ PreviousCan The AFC Playoffs Get Any Tighter?